Research being done at Rochester Institute of Technology to refine lab-on-chip devices—highly sophisticated laboratories on microchips—will provide more detailed and timely information to detect diseases such as cancer. 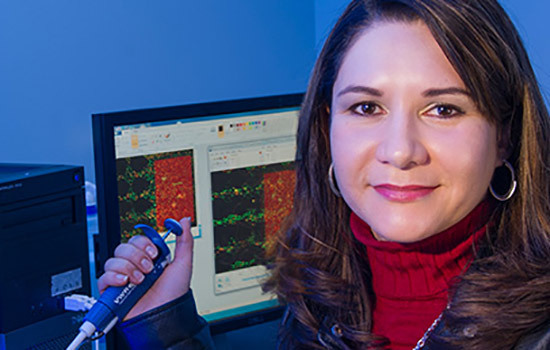 Blanca Lapizco-Encinas, a faculty-researcher in RIT’s Kate Gleason College of Engineering, is improving the process of separating biological cells and biomolecules using chromatography principles, a well-established technique for separating proteins, combined with a newer technique called dielectrophoresis, a process that uses electrical current to separate biomolecules. In biomedical analysis, clinicians may have to analyze complex blood samples consisting of cells, proteins and other micron-sized particles, in an effort to separate healthy and diseased cells. Improved microfluidic techniques with the potential to separate cells found in bio-fluids, are useful in settings where rapid results are essential such as testing for food and water safety or clinical analysis of disease. Lapizco-Encinas is building micro-channels into lab-on-chip devices that will have a dense array of insulating structures to emulate the stationary phase found in chromatographic systems. The new arrays have distinct columns where particles will be retained. Lab-on-chip devices are often made of glass or a silicon base where bio-fluids stream through etched channels. Devices also have complex sensors and electronics embedded, and the combined technologies will advance screening and laboratory analysis applications through a new technique she is calling dielectrophoresis chromatography. The new research, utilizing electroosmotic flow—the motion of liquid in chemical separations—is expected to drive particles across the microchannel. This process of electroosmotic flow offers the potential for the biomolecules to be manipulated in real-time, allowing for dynamic separation schemes. This work expands Lapizco-Encinas’ previous research that focused on the development of multi-channel devices where fluid samples are assessed after being exposed to electrical currents that cause the bio-particles to separate for more efficient analysis. Through past research, she and her team advanced device system designs and determined an optimal threshold of electrical fields applied to adequately manipulate the fluids and ensure that live cells are not damaged. Adding chromatographic principles to this foundational work is underway.